First off, don't get so excited with eBay prices that you pay more than the price of a new tool! The current MSRP of the Shopsmith Mark V-Powered Scroll Saw is $699.99. The MSRP of a new Shopsmith Free-Standing Scrollsaw was $849.99 in early 2008, but it looks like this may no longer be available from Shopsmith. 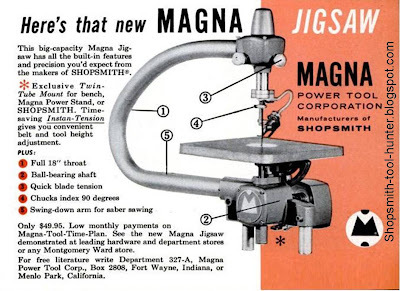 Most folks don't know that there have been two models of Jig Saws sold under the name "Shopsmith"; One for the original 10er, and later one made to be powered by the Mark V and Sawsmith Radial Arm Saw. Likewise there have been two Scroll Saws. (Three if you include the short-lived SS mounted Hawk from RBI). One scrollsaw was made to be powered by the Mark I, Mark II, Mark V Model 500, 505, 510 and 520, as well as the Power Station, Crafters Station and an STP Stand. The other is a self-contained Free-Standing unit with integrated Variable Speed.